In his magnificent new novel, Charles McCarry returns to the world of his legendary character, Paul Christopher, the crack intelligence agent who is as skilled at choosing a fine wine as he is at tradecraft, at once elegant and dangerous, sophisticated and rough-and-ready. As the novel begins, Paul Christopher, now an aging but remarkably fit 70ish, is dining at home with his cousin Horace, also an ex-agent. Dinner is delicious and uneventful. A day later, Paul has vanished. The months pass, Paulís ashes are delivered by a Chinese official to the American consulate in Beijing and a memorial service is held in Washington. But Horace is not convinced that Paul is dead and, enlisting the support of six other retired colleagues—a sort of all-star backfield of the old Outfit—Horace gets the "Old Boys" back in the game to find Paul Christopher. They start with a photo found in Paulís study: a womanís hand holding a centuriesí old scroll, once in the possession of the Nazis and now sought by the U.S. government and Muslim extremists alike. Harassed by American intelligence, hunted by terrorists, Horace Christopher and the Old Boys travel the globe, from Xinjiang to Brazil, from Rome to Tel Aviv, Budapest to Moscow, in search of Paul and the unspeakably dangerous truth. 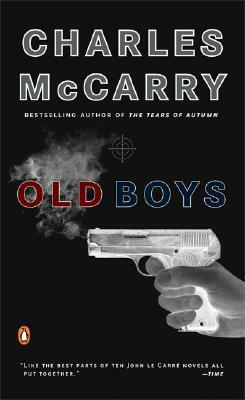 Charles McCarry served under deep cover as a CIA operations officer in Europe, Asia, and Africa. He is the author of nine critically acclaimed novels, as well as numerous works of non-fiction incuding Citizen Nader. He currently splits his time between Florida and the Berkshires.